The Arizona State Troopers Association withdrew its endorsement of Democratic Senate candidate Kyrsten Sinema this week, announcing it would stay neutral in the contentious Arizona senate race. 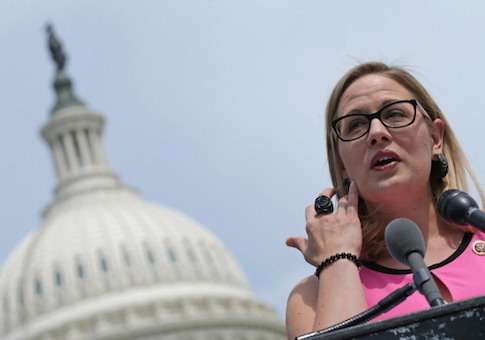 The association previously endorsed Sinema, a congresswomen representing the Arizona's 9th District, in her last three congressional races. However, newly discovered comments from Sinema calling Arizona the "meth lab of democracy" and saying it was "fine" if Americans joined the Taliban left some troopers less than enthused about her candidacy. After initially announcing their endorsement of Sinema, the association conducted a poll of its membership that led to the pulling of the endorsement. "The membership has indicated a preference to stay neutral," the group announced on Oct. 22. According to some members, the executive board voted to endorse Sinema in the first place without consulting members. "All members are encouraged to vote for the candidate they personally support," the association said. "AZTroopers will refrain from any political statements concerning the race until the conclusion of the election." One member, Trooper Dave McDowell, said that although he supports Sinema's opponent, Rep. Martha McSally (R., Ariz.), he doesn't think that the association should endorse any political candidates, for fear of politicizing the Department of Public Safety. Sinema and McSally are in a neck-and-neck race to fill the senate seat left open by Sen. Jeff Flake (R., Ariz.), who is not running for re-election. During a debate between the candidates last week, McSally attacked Sinema for comments she made in the aftermath of 9/11 saying she "didn't care" if American's joined the Taliban. "CNN reported that in 2003 while she was on the radio, you said it was okay for Americans to join the Taliban to fight against us," McSally said during the debate. "You said you had no problem with that. Kyrsten, I want to ask you right now whether you are going to apologize to the veterans and me for saying it's okay to commit treason." Sinema did not answer the question, instead accusing McSally of "engaging in ridiculous attacks." Polls show McSally and Sinema nearly tied, with McSally polling just slightly ahead less than two weeks from election day. This entry was posted in Politics and tagged 2018 Election, Arizona, Kyrsten Sinema. Bookmark the permalink.